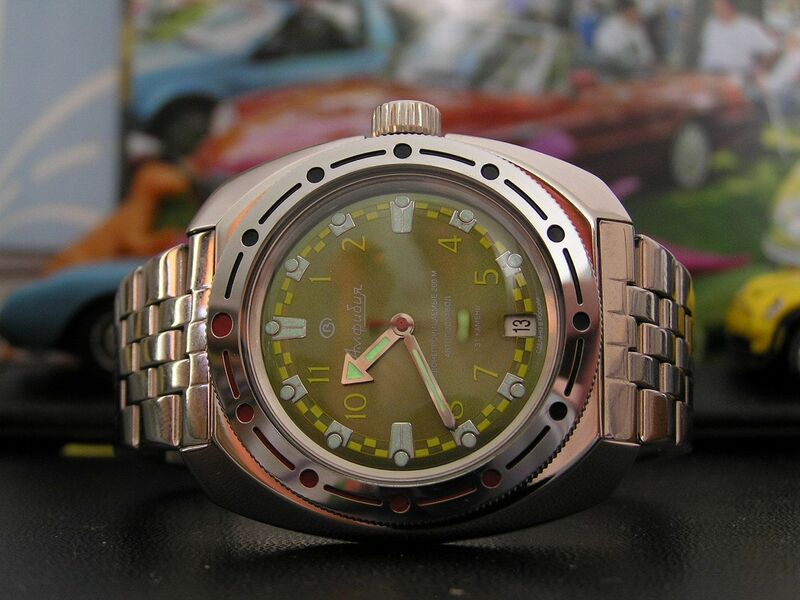 Many watch enthusiasts are familiar with the Russian watch brand Vostok (sometimes spelled Bostok, the name means ‘east’ in Russian). 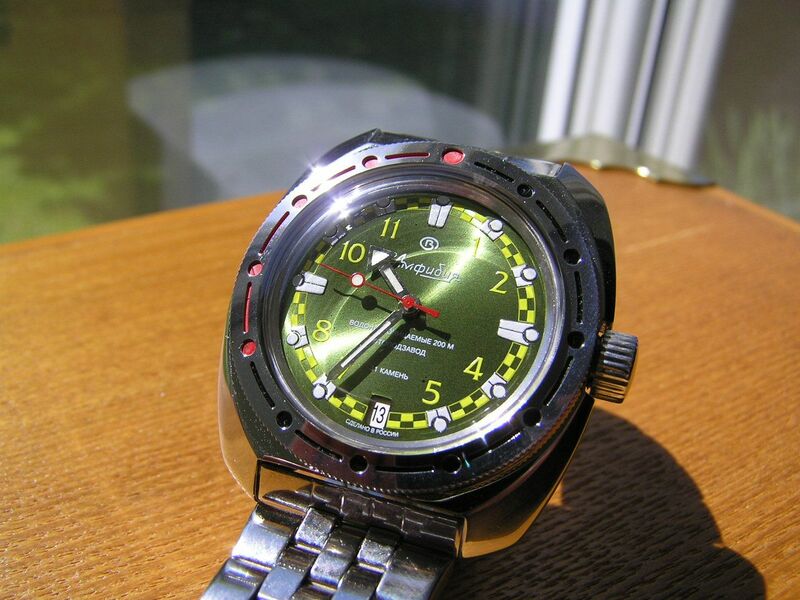 This is at least the fifth Vostok I have owned. I wanted something funky to add to my rotation and it usually isn’t too hard to find something funky in Vostok’s seemingly endless lineup of models, including many newly released styles that fill the funky bill. 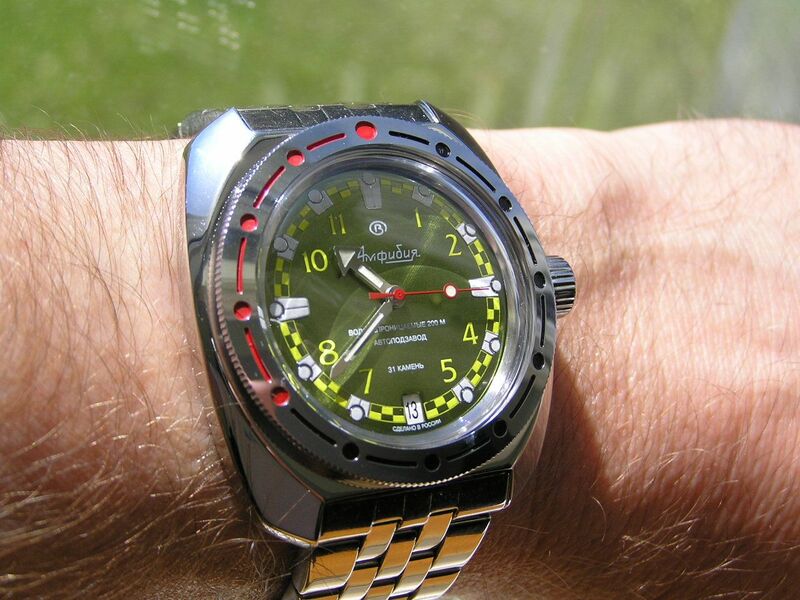 This Vostok Amphibian is a new model and sports a chunky, nifty case style that really attracted me. The green dial also caught my eye so I pulled the trigger. Coming straight from Moscow, this puppy is unique and attractive, with the many ‘quaint’ Vostok traits that you either love and/or hate. 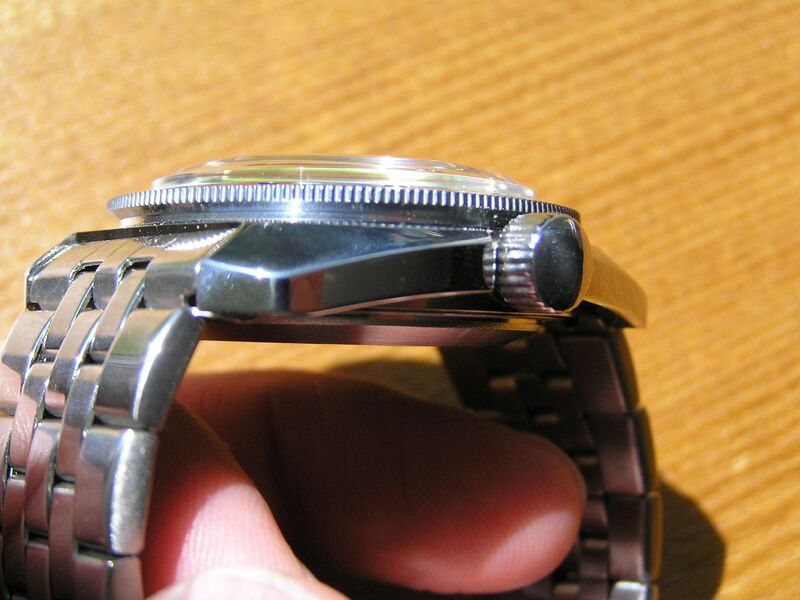 The stainless steel case measures about 41mm without the wobbly crown, 44.4mm with the wobbly crown. The wobbly crown measures 7mm in diameter. Lug width is 22mm, case thickness is 14.5mm. The case back is signed, screw down and is stainless steel. 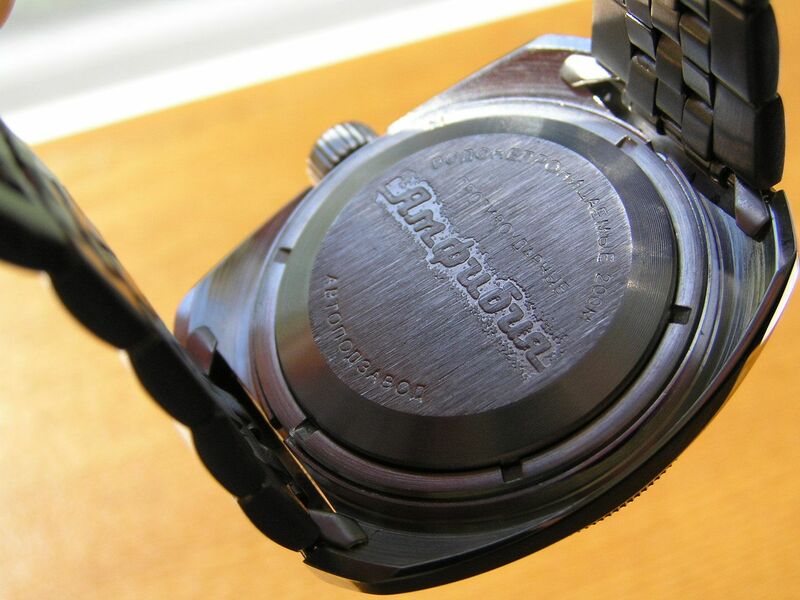 This watch is factory rated at 200 meters water resistance. Inside beats the venerable Caliber 2416B 31-jewel automatic movement. This movement can be hand wound through the wobbly crown (an experience unto itself), but does not hack. 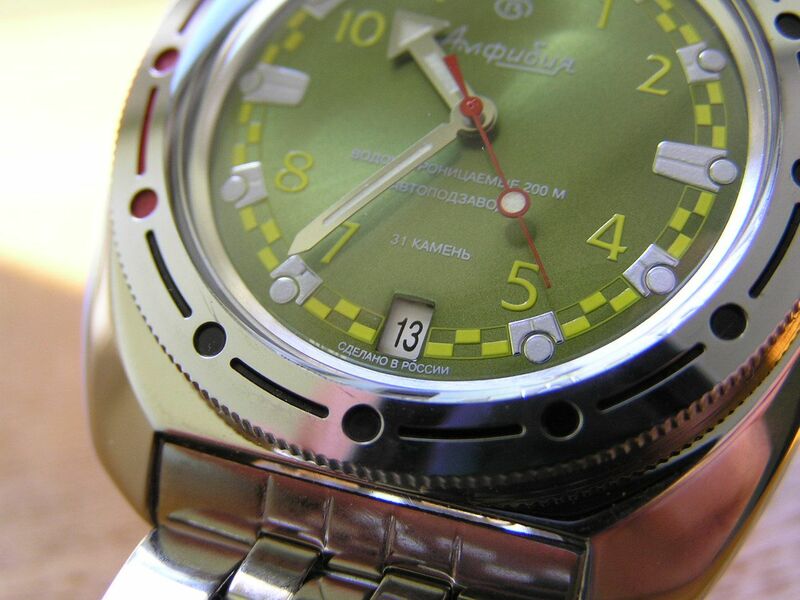 The date is also not quickset, something that has always disappointed me with Vostok’s watches. The date window is located at the 6 o’clock position. 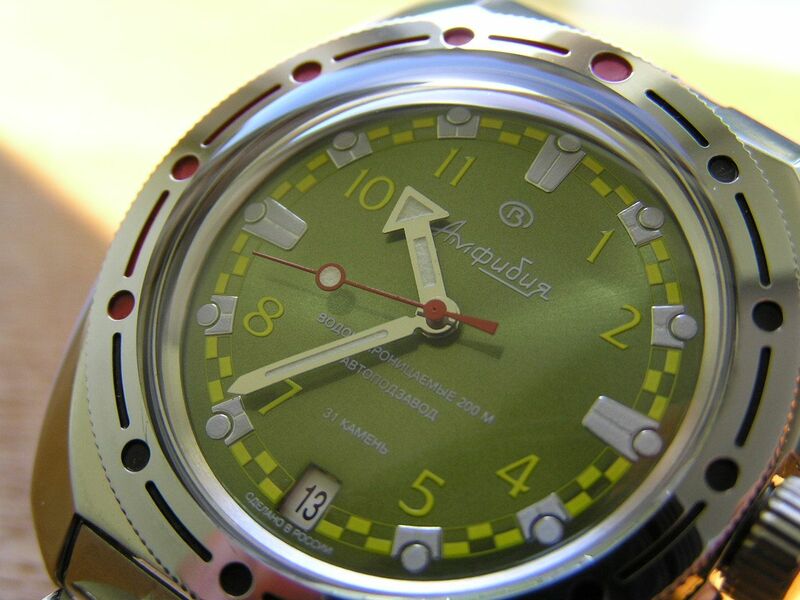 The shade of green on the dial is most appealing, at least to me. No forest green, mint green or lime green here. It’s kind of a medium green with almost a metallic flavor, think 1972 Chevy, not 1958 Pobeda. The dial is ringed in a wreath-like pattern in yellow. I at first thought this might look a bit frilly, but I actually like the execution. The yellow trim imparts a sort of rally-look to the dial. 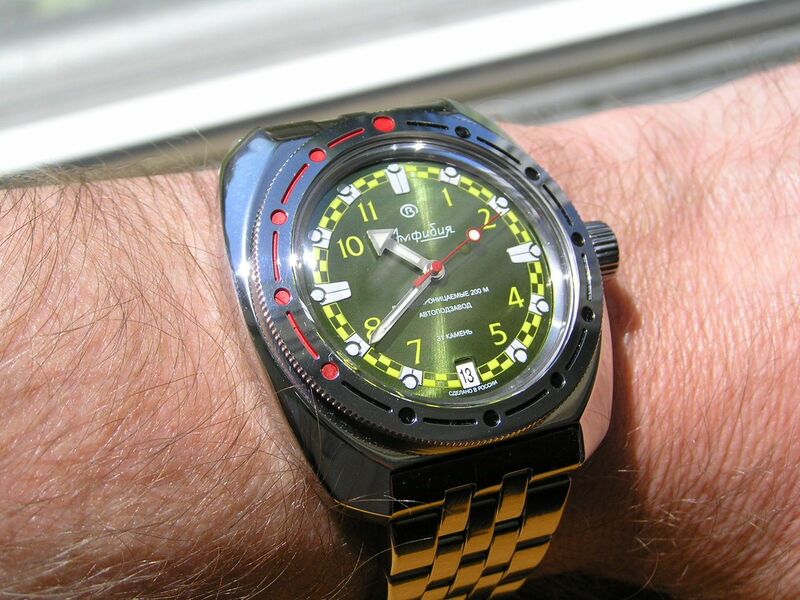 The arabics are printed yellow and the hour markers are Swiss Luminova luminous (the markers look really cool when they glow, sort of like little radiation symbols) but I feel that the quality of the lume is just so-so, not real bright or long lasting, but consistently applied. The seconds hand is red and is tipped with luminous. The hour and minute hands are luminous as well and are shaped well and look great, although they could be a tad larger in size; the dial tends to be a bit busy on this model and the hands get lost somewhat at times. The crystal is standard domed acrylic, so if it scratches, it will be easy to polish up and be ready to accept more abuse. The bezel is standard-issue non-clicking, omni-directional Vostok, with the standard 20-minute markings on the opposite side of the bezel, leading me to believe they intend it to be used as a countdown timer. 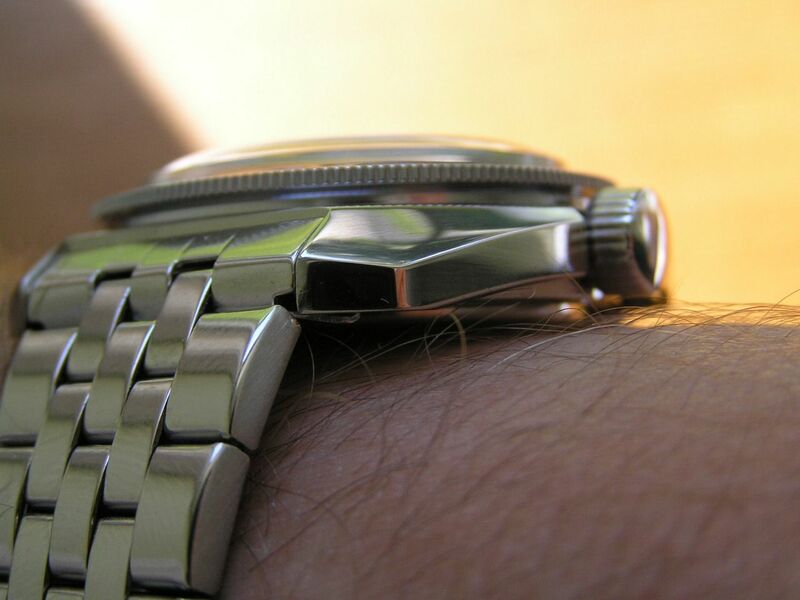 The folded link stainless steel bracelet seems markedly improved over the last bracelet I had on a Vostok Amphibian, but that’s not saying much. At least they are wrapping the ends of the links, so the folded part doesn’t show. It’s still a fairly lightweight, rattle-prone design. 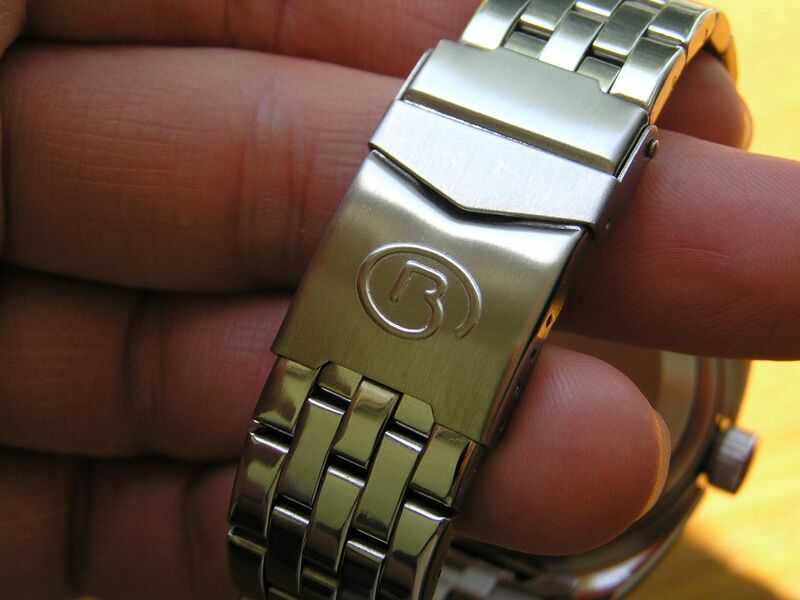 The clasp is signed and is double locking, The bracelet measures 21.5mm at the lugs and tapers to 18mm at the clasp. The bracelet sized up nicely and since it’s all part of the quaintness of this watch, it will remain in place. 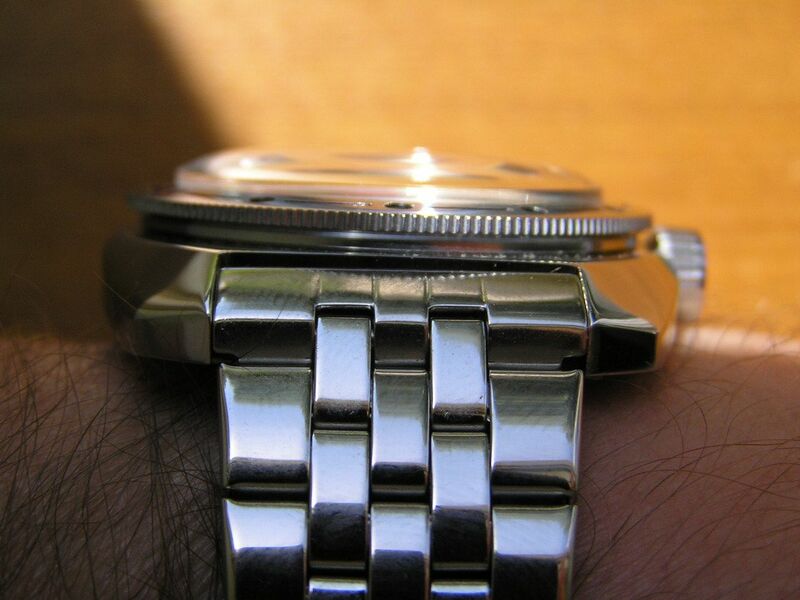 Overall fit and finish on this watch is pretty decent; the stainless steel case shines nicely and the crown screws down fine, although it still is wobbly and the winding action is exactly the same as previous Vostoks. Being quaint can get tiring after awhile. 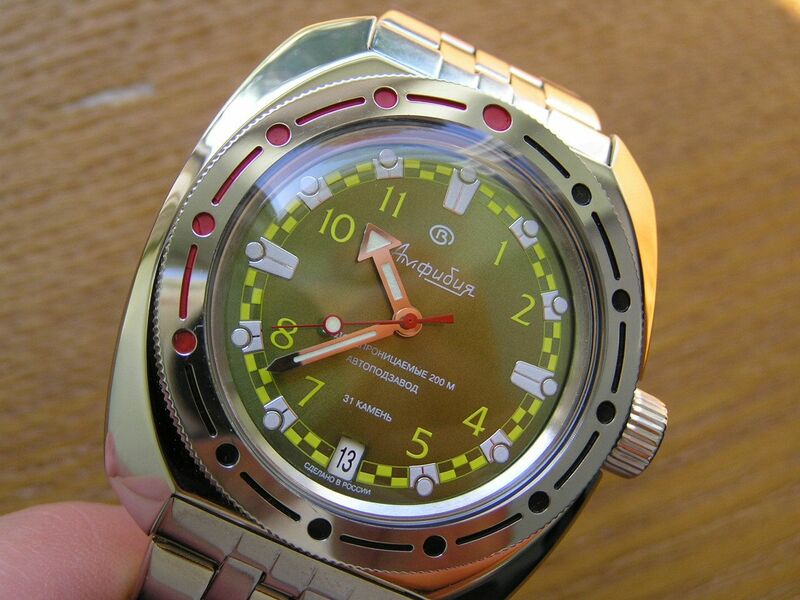 If you like Russian watches, you certainly can’t go wrong with a Vostok Amphibian. Decent water resistance (yes, they truly don’t leak! ), a myriad of dial and case styles to choose from and affordability for a rugged automatic makes these watches a good addition to any collection. 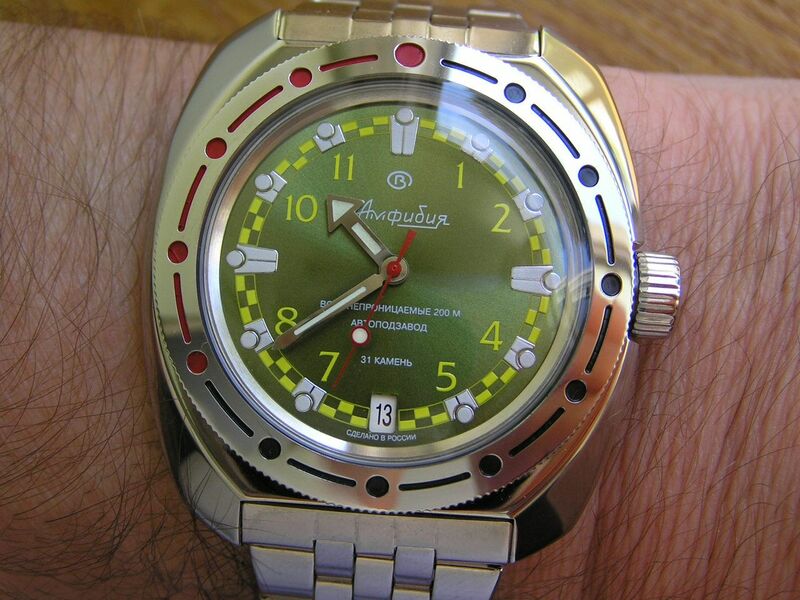 I always think any true WIS should sport at least one Russian watch in their collection, and the Vostok Amphibian is a great place to start. I sold this watch about six months after I bought it. I couldn’t quite adjust to the yellow markings against the green dial, along with the red second hand against the green dial. 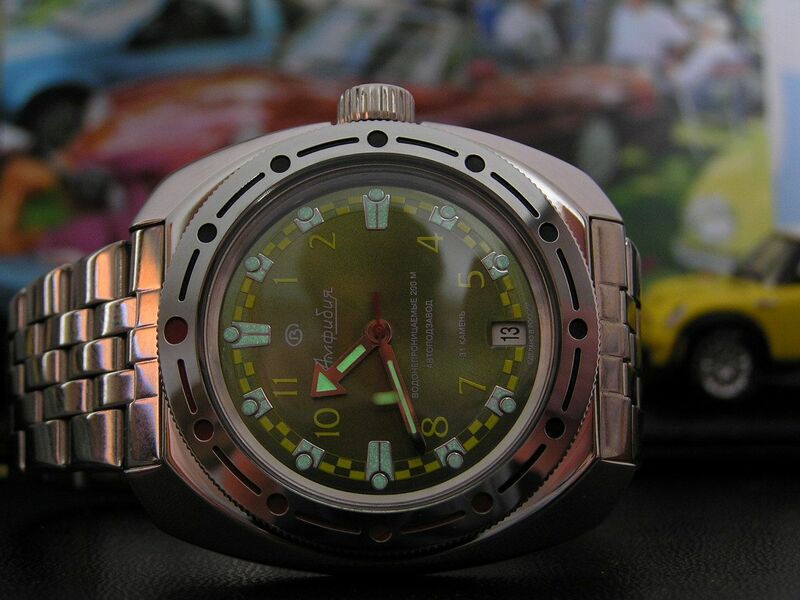 It was a nice piece and proof of Vostok’s value, but this particular model just didn’t end up doing it for me.